Buying a car or an SUV today feels more and more about compromises. Compromising to your budget, compromising for fuel cost, and yet some things you cannot compromise for like the size of your family. If you need a crossover vehicle that seats 7, it doesn't matter how great a bargain or how wonderful the MPG is if two people need to sit at home or you need to take two cars for one family trip. Thankfully your local Kia dealer has something in stock for you in the Kia Sorento. This 30 MPG SUV is the best 3rd row seat SUV for mpg. There's a lot to love about the Sorento, from its $21,250 base price to its available 10 year 10,000 mile power train warranty, to being an IIHS 2012 top safety pick. For people that are struggling to deal with a large family but still compromise its one of the best cars that fit seven people. It even has available AWD options though expect that to cut into your fuel economy. A SUV without compromises? Sounds like the best 2012 SUV ever! Well not entirely. 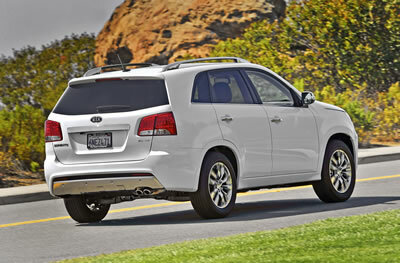 The base Kia Sorento gas mileage is 21 City / 29 Hwy EPA estimated mileage. If this sounds slightly less then the 30 MPG SUV you were promised you would be right. Where that 22 City / 32 Hwy EPA comes from is the GDI fuel system found only in some packages of the Sorento, namely the LX with the Convenience Package and EX trims with the 2.4L engine. The package comes standard on the EX which has a base cost of $25,950 or adds an extra $1,650 to the LX package putting it just at the edge for an SUV under 25000. 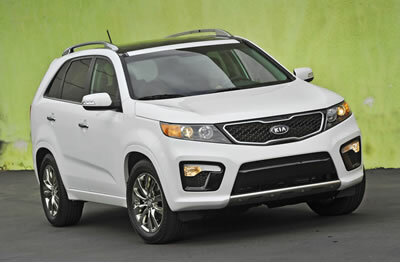 Is it worth the extra couple hundred to your Kia Sorento MPG over 30? On its own likely not as the 21 city / 29 Hwy mileage provided by the standard is still near the best 2012 SUV with a third row seat. Just avoid fuel guzzling options like the AWD and V6 if fuel economy and price are high on your list. The list for a suv under 25000 that seats 7 and gets good MPG is pretty tight. Most SUV's for a family of seven cost thousands more then the Sorento and none have the combination of value and gas mileage that the Sorento has. 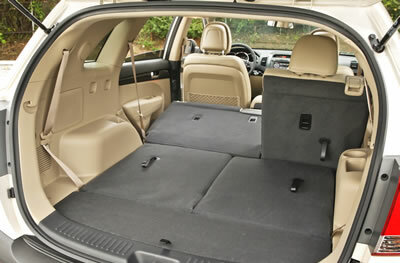 While the third row seats do cut down on available cargo room when in use, the truck is not eliminated altogether and with the rear seats folded down the storage space is substantial. Use the Kia dealer locator to find your nearest Kia dealer and test drive it for yourself.